Earlier this week, ComingSoon.net got the chance to travel to Amblin Entertainment, where producers Bob Orci and Alex Kurtzman and director D.J. Caruso showed us the first 30 minutes of Eagle Eye and answered questions about the Paramount/DreamWorks thriller, opening in theaters on September 26. In Eagle Eye, Shia LaBeouf and Michelle Monaghan are two strangers who become the pawns of a mysterious woman they have never met, but who seems to know their every move. Realizing they are being used to further her diabolical plot, they must work together to outwit the woman before she has them killed. 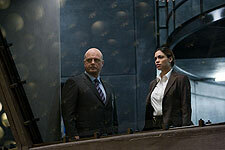 Rosario Dawson, Michael Chiklis, Anthony Mackie and Billy Bob Thornton co-star. The nail bitting thriller starts off with Michael Chiklis at the Pentagon trying to determine the idenity of a terrorist the U.S. has been tracking. The President gave him the green light to attack, but Chiklis is apprehensive because there is only a 51% probability that the man is who they think it is. We then see Shia LaBeouf Jerry playing poker with a couple of his friends –well, more like scamming them out of their money. We soon learn that his lovable and charming character works at the Copy Cabana and isn’t too financially stable. He dropped out of Stanford because he just didn’t want to go anymore and struggles to pay rent. He doesn’t have money in his account, which isn’t the case for long. As he deposits a check, his account, which had insufficient funds before, now mysteriously has $751,000. The ATM begins spitting money at him and he’s so freaked out by what’s happenning. As he runs back to his apartment, he pays his landlord the rent was behind on and she tells him she had to go inside his place to help with the boxes. Of course he has no idea what she’s talking about, so she opens the door and he sees dozens of boxes which contain weapons and bomb-making materials. He’s freaking out when he gets a phone call from an unknown number. A woman tells him he has 30 seconds to get out of the apartment because the FBI are on the way. He’s on the verge of a breakdown and begins asking the woman what is going on. She calmly tells him he now only has 24 seconds and he has to get out. He refuses to listen and the FBI break through a window and tackle him to the ground. He’s arrested and interrogated by Billy Bob Thorton, who believes he’s a terrorist based on the evidence found in his apartment. LaBeouf has no idea as to why he’s being set up, but nobody believes him. Meanwhile, Michelle Monaghan is out having drinks with a couple of girlfriends. She is a single mom and her son has just left for band camp. She gets a call and thinks it’s her son. She goes outside the bar to hear him better and it’s the same woman who called LaBeouf. She tells her to look up at a digital sign and Monaghan sees a video of her son. The woman asks what she’s willing to do to save her son. She’s told if she doesn’t do what she is told, the train her son is on will be derailed and he’ll be killed. She’s told to steal a car and drive to a location. Little does she know she’s about to pick up Shia’s character who has been busted out of jail. When the two meet, she thinks he’s responsible for this and begins hitting him. He tells her he got the same call and then the woman’s voice is heard commanding them what to do next. Billy Bob is mad as hell at Shia’s character for escaping and has called for every police unit in the city to track him down. With the police pursuing them, an intense and fast paced car chase unfolds which is one of the best we’ve seen in awhile. Alex Kurtzman: It’s very strange to watch this with you, because you’re literally our first audience. We’ve never seen this in a room with people before. We’ve been living in the editing room. Q: So this is one of those films that isn’t going to go through the test screening process? D.J. Caruso: Thank god it’s not! Q: How do you avoid that? Caruso: I think we just ran out of time! I’m glad we’re not doing it. Kurtzman: It’s such a big movie to cut that rather than rushing it through we wanted to take our time with it. The last thing you want to do after taking so much time prepping and shooting a movie is rush it through post. Q: Do you have a runtime locked? the second reel alone has a lot of choices in it, so we’re honing it all. But we’re excited. Q: Did you shoot a lot handheld, perhaps with crew from “The Shield”? Caruso: I didn’t use the “Shield” crew, but it’s definitely “Shield” influenced. As great as all the “Bourne” movies are, everybody’s saying “oh, that’s so great!” I’m like, “we were doing that on ‘The Shield’ nine years ago!” But I wanted to go a little bit handheld. I think there’s a tendency now to abuse the handheld camera just to have it. So I wanted to be in there and feel like we were documenting it properly, but not be crazy. And a lot of that, believe it or not, for the first time in my career is Steadicam. I found an operator that I love who makes it have sort of a handheld feel, so a lot of what you’re seeing particularly on the ground, is Steadicam. Q: It’s also got a very practical feel. Whether there’s a blend of practical and CGI or not, all the car stuff feels very visceral. you have to have a high standard because our movie isn’t like “Transformers” where you sit and marvel at how amazing it is, it hopefully has to go by in a naturalistic way, which I think makes visual effects that much harder. Kurtzman: “Transformers” is a heightened world; it’s our world, but it’s also a cartoon. This movie does not exist in that world at all. That’s why a lot of choices were made to keep it grounded. The shakycam thing, or whatever you want to call it, we just wanted it to feel like you were there. Caruso: When I first met these guys and we were talking about it, I said to them “it feels like ‘The French Connection. '” To me this is “The French Connection,” it just so happens that technology is immersed in it. it’s real. Alex, I think said at the end of this movie we want people to fear their BlackBerry. Q: You’ve been good about keeping the secrecy with respect to what this movie is about. Was that intentional from the beginning? Caruso: I think in general, with Steven [Spielberg, Executive Producer], he loves for the plot to stay fresh until you actually see it. I think it’s a little bit of both. As the story unfolds it’s not like there’s this great sort of “a-ha!” moment where you suddenly get it, but you keep working and working and if you know where the movie was going eventually it might not be as enjoyable. You want the audience to be working to figure it out, and even as things unfold and we get to act three you’re still trying to figure out exactly what’s happening. The first movie I made, “The Salton Sea,” sorta had that feel. You didn’t know exactly what the hell was going on. To me it was one of those unconventional story strengths. I feel like we have that strength as well. You just have to keep working at it and once you think you’re on it, it’s not exactly what it is. Not like there’s uber twists or anything like that, but this movie makes you work and actually, it’s a lot more plot-heavy than you would think. You’re always wrestling as a director with character versus plot, and a lot of that was happening in this movie. Kurtzman: And that’s interesting because as a writer you say character is plot; you have to tie those two together or else they feel so divided and the audience is seeing one thing and feeling another thing. Orci: You want the audience to be subjectively in the same place as the main character, so the less they know the more they really are experiencing the same things. Caruso: Even the greatest video games, I think, are the ones where you’re going around a corner and you have no idea what’s coming. The first two reels of this are, in a way, like level two of a game. So eventually you have to take control, and I think that’s what our characters decide to do, and as the movie progresses and they’re being led around they have no choice and they have to get out of this they have to get control. I think that makes the movie fun; it is sort of a big video game. Kurtzman: That point of view I think is also borrowing a lot from Hitchcock. When you’re watching a Hitchcock movie you, for most of the movie, are playing the guessing game. What’s the endgame? What’s the plot? How are these people involved? It’s the best way to tell the story, and as a viewer, that’s what you want to experience. Caruso: The other thing there is, it’s not necessarily just the “who?”; what is just as important to me in this film is the “why?”As you discover the identity of the “who” you’ll try to understand why it’s happening, and that’s as intriguing. Q: In a movie like “Enemy of the State,” they really show how things are happening, but here we don’t seem to be seeing how this technology is being taken over. Is that easier to write? Orci: Not in the least bit, because it all has to make sense retroactively. You can’t just do random things. They have to add up. Kurtzman: This movie was unbelievably hard to construct because you could come up with really cool scene ideas but at the end of the day you’d end up hitting the eject button on half of them because they didn’t pay off in the right way. And then you’d just have to let it go. This was a part of, I think, why Steven had this idea ten years ago and it’s taken time to get going. If you do it right, it’s really complicated and you’re going to have to go through many, many drafts to get the architecture right. 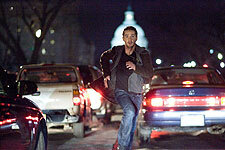 “Enemy of the State” is different, too, because it’s asking you to step outside the characters a lot. Technology was really new at the time, all the surveillance equipment. This isn’t really a movie about surveillance equipment or who’s manipulating it, it’s a movie about these people and their problem and how they get out of it. Q: You reference “The French Connection,” which is a very small movie, but both the most recent trailer and the opening of the movie suggests a very broad scope. How do you balance the tight feel and large scope? there’s just something about the texture of it. And as far as the scope, yeah, the movie opens up a little more and gets a little bigger but I think it’s the two characters that keep it contained. Q: Is this meant to be rated R? Caruso: It’s hopefully going to be PG-13, and after seeing Batman I’m not that concerned about it! Q: So are we meant to be aware that in these massive car accidents people are actually dying? Caruso: Who died? (laughter) No, it’s a great question because what I realized was that it inhibits your action. You can’t shoot great action if you’re worried about people dying. And when you get to the end of the movie you’ll sort of understand why it’s OK for some of those people to die. No, we’re not sitting there and harping on it, but there’s a body count that’s sort of adding up at the end of this film, and you’ll realize at the end of the day there’s actually a purpose for that. I don’t want to say collateral damage, but in a way it’s all part of a bigger plan where you have to sacrifice people. Q: Bob and Alex, is it easier to work on a film like this where you don’t have the fanboys breathing down your neck? Kurtzman: It’s just a different experience. We love, love love doing those movies because we are fanboys. But it’s really nice to step outside that and do a movie with someone like D.J. that feels like it’s grounded in a different kind of reality. Orci: The flipside is that we don’t get any ideas from fanboys! Q: Do you have room to improvise here, or are you sticking to the script? Caruso: My style is always to give the actors freedom as long as long as the words and the story and scene still have the same meaning. We go through a pretty intensive rehearsal process where we don’t necessarily lock lines down, we lock our heads and decide what the scene is about, so if the words change along the way, we’re cool. And Shia can turn it into gold. He can give the same intent of dialogue on the page that isn’t sounding quite right. That’s his greatest gift to a filmmaker. Kurtzman: And we worked with a lot of cool writers on this movie; everyone brought a different thing to it. Caruso: The problem with Shia, though, is that the other actors see that and then they think they can do the same thing. Kurtzman: That’s a great point. There are very few actors who are truly good at improvising; that’s a real skill. To be a real good improviser, to make something funnier and sexier, that’s a very tough thing to do. And Shia makes it look easy because he is that guy. Q: So do you have a secret deal with Shia to only make movies with him? Caruso: Honestly, I would! It’s a blessing every day, because he comes to work and just gives 110%. He almost tortures himself because he just wants to be good. Even if it’s the smallest thing and he’s only there for half a day to do a shot where he picks up a Coke can. He’s so committed, and it’s infectious. He makes you love your job, so of course I’d work with him again. Q: Is “Y: The Last Man” going to happen? Caruso: It’s probably going to be happening, yeah. With New Line now part of Warner Brothers, Warners is now very high on the project. And Carl Ellsworth and I are probably going to deliver the script to WB/New Line by next week. Q: Did you direct any of the last season of “The Shield”? Caruso: I didn’t get to because I was doing this but I know the last episode is unbelievably explosive. It’s so much so it’s fantastic. It’s sort of a dream, like what I think “The Sopranos” should have been at the end. Q: Robert and Alex, what are you writing now? Are you just working on “Transformers: Revenge of the Fallen”? Kurtzman: We broke the whole [“Transformers”] story before the strike and they were able to prep an outline we’d written during the strike. The second that ended Bay locked us in a room for two months. It was nuts. We literally lived in a room with Ehren Kruger, the three of us, and they were shooting three weeks later. It was insane. Q: Why not go to Comic-Con with “Eagle Eye”? Caruso: This movie comes out on September 26. I really feel like I’m going to finish it on September 12. I mean that! I don’t know how that happened, but it did. It’s enormous. So we figured we’d bring a few people here to see some of it. Q: The first two reels have a lot of action. Does the movie ever let up? Kurtzman: It’s funny you say that, because before we started today I said “I hope the first act isn’t too slow!” Because when it gets going, it’s a bullet to the end. Caruso: It’s pretty much that, yeah. But there’s some great scenes and character in there. It’s action with incident, so things are always happening and you’re always learning about people as it happens. We don’t stop the story. Q: Do we ever see more of the main characters’ lives and backstory? Caruso: You’re going to be propelled forward, and you’re going to get a little bit of a look back into Shia’s life particularly. Mostly you get a little bit of him towards the end of act two. Kurtzman: I think too that these movies are always best when a character is forced to confront their flaws by attrition. They’re forced into a situation where you’ve got basically 24 hours to face your worst demons at a time when you never thought you’d have to do that. That’s part of what makes these movies good. So a lot of it is about seeing their lives from a new perspective because the insanity that they’re thrown into. Q: Steven Spielberg came up with this idea ten years ago? What part of that idea survived? Orci: The kernel of what he pitched us was: what if the world turned against you in every way that it can, when everything is so interconnected. Kurtzman: What if all the tech that makes your life easier could be manipulated by someone else, and that in turn could turn you into someone you don’t want to be? Q: As the movie goes on, can audiences catch on to clues placed within? Caruso: Definitely. They’re there, all seeded throughout. They’re not intentionally planted so you can figure it you, but if you catch things you’ll understand it. Q: Of what we saw today, what was the most difficult to film? Caruso: Obviously the car chase, because it’s all the different pieces. And what I loved about this chase was that our characters were meeting each other for the very first time. These two worlds collide and as they’re trying to figure things out there’s all this mayhem. And also the opening sequence with Chiklis in the Pentagon. It was a tough scene to get all the beats right. Q: Can you elaborate on what you mean when you say that you’ve cracked “Y: The Last Man”? and also Act 3, where do you end the first movie and how can you go from there? But I think we licked it. Q: So is this a trilogy? only a five or six week journey from that point to the end of the first movie. It’s been hard, in a good way, just because there’s so much good stuff to choose from, and every time you start throwing certain scenes in the screenplay you’ll see that it sort of dislodges and starts to head a different way. Q: When do you think this might happen? Caruso: In a perfect world, and I was talking to Shia about this yesterday because he really wants to do it as well, I would like to prep this movie in October and shoot by January. Q: So you’re thinking summer 2010? Caruso: 2010. That’s what I’ve been hearing. Warner Brothers is saying “we need movies for 2010!” And I say “we’re the movie!” I’ve got a movie star, I’ve got a great comic book, whatever. Caruso: He has, yeah. He definitely has. But you want to get it right. You don’t want to make the movie just for that reason. Q: So he would do it? Caruso: He wants to do it, I want to do it. The thing we have to worry about is him being exhausted. So I said if I prep in the fall and we start in January, that’s a nice big break. Q: Would you film in Australia? you know. Because to them, it’s Warner Brothers now, you’re re-educating a new crew. Q: In going to Warner Brothers, could you end up with a bigger budget?